Playing Field 120 x 70 cm. Packing 160 x 77 x 26.5 cm. 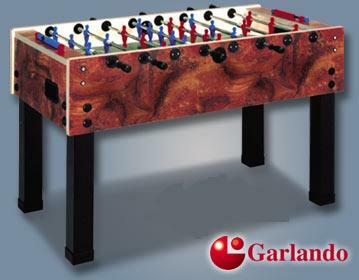 Garlando Foos-G-2 Foosball Soccer Table featuring the traditional one-man goalie rod! … A great table for frequent home use. 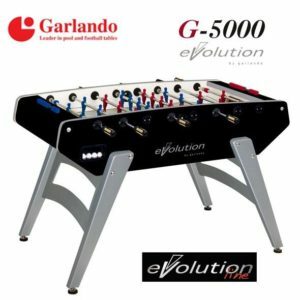 Perfect for Beginner to intermediate level players! Telescopic rods, safer, less room required. Nylon bushings with ball bearing inserts for high speed action on a laminated playfield. 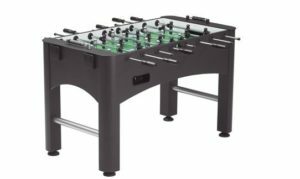 This table features 14″ deep cabinet, 4″ X 4″ solid wood legs, and nylon bushes with ball bearing inserts. Guaranteed Unbreakable Men Moulded to the Rod!